Like some of my recent reviews, I’m also writing this a bit after the fact, so some specific details may be lost, but my general opinion has remained the same after ruminating on it. Overall, I found The House to be quite disappointing. 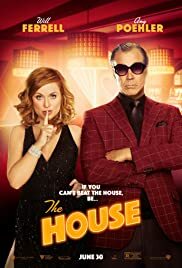 It’s a Will Ferrel film, so comedy is to be expected, but I’d label this as a sub-genre I like to call trash-comedy: films that rely mainly on stupid (often physical) humor that have no real right to be funny. Often, I find these “trash-comedies” to be hilarious and will default to them when I can’t decide on a movie to watch. Examples include The Hitman’s Bodyguard3 (although that’s more action-focused), or perhaps even better, either of the two Horrible Bosses films. From a critical/Oscar Best Picture point-of-view, you probably couldn’t make any worse of a film. And yet, I’m often drawn to this adolescent comedy. With The House, there was just a lot missing or not done well. It did have its moments, and did include some gut-busting laughs, but a majority of that was lost for me with the too-serious, yet not-serious-enough vibe. To use some gambling terms, The House seemed to go all-in on the wrong parts and folded too early on some real gems. I was in so much disbelief that what I was seeing could actually happened, that my suspending skills were non-functional. As a basic premise, two parents (Will Ferrell and Amy Poehler) starting an illegal gambling ring with their friend (Jason Mantzoukas) seems ripe for potential. In execution, it fell hard on its face and couldn’t get up from a one-punch KO. Frank Theodorakis (Mantzoukas) was simultaneously one of the best characters and funniest parts of the film, but also the worst. He was one of, if not the, driving force of the film and almost every turn he took was for the worst. I get that being a gambler he made poor decisions and that should carry over into making their in-home casino grander and more far-fetched the more successful they become, but I couldn’t help wondering at what point would enough be enough. This thinking does miss part of the central conceit of the film, but as hard I tried, I couldn’t distract myself from it and it ruined the film for me. A good practical example from the film was Scott Johansen’s (Ferrell) massive character turn to become “The Butcher”. “Why” and “no” were the two words that crossed my head when that turn happens. It just feels like too much and out of place for the kind of film that The House is, or perhaps rather, the film I wanted it to be. Your mileage may vary given your affinity for Ferrell, Poehler, Mantzoukas, and what I’m deeming “trash-comedy” genre. I think you can find films more deserving of your time and ones where the debauchery fits better with the story the filmmakers are trying to tell.